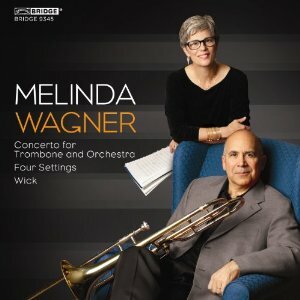 Melinda Wagner‘s Concerto for Trombone and Orchestra begins unpretentiously, with a delicate version of the composite attack/decay that is a standard opening ploy for so many pieces: a soft single note from the harp and timpani, with the decay provided by half the second violins, tremolo. Then the first phrase from the soloist is heard: pianissimo, curving up and then down. The pitches can be parsed into two octatonic scale segments, with that sustained tremolo note shared by the two segments. But what you attend to is not the harmonic structure, though that is what gives the phrase coherence; rather, what is most striking is the simple elegance of the shape, with its minor thirds to begin and end, with its highest pitch sounding like an upper neighbor, resolving down by step. Reiterations of the orchestra’s opening sustained note are fitted around the phrase at exactly the right time. For example, the highest note of the trombone phrase is also the longest note, so that’s the place for a fresh harp pluck. The rest of the second violins sneak in as the soloist reaches his cadencing minor third, and repeated horn notes affirm the end of the phrase. These opening bars are poised, suave, satisfying in a modest way. But what happens next raises the stakes. It is an effect created by an different sort of composite sound: violas, cellos and contrabasses divided into a total of 8 parts, adding seven pitches to the sustained opening note, and bound together with the ringing sounds of piano, harp and a tam-tam stroke. It is as though the sustained note suddenly became three-dimensional, changing from a simple line to a geometric shape, heard in perspective – exactly the effect Mindy speaks of in her program note when she writes how she “tried throughout to imbue the orchestral writing with a sense of three dimensions – of space and the presence of a vanishing point.” The soloist enters as that low chord dies away, with a longer, more wide-ranging phrase, again beginning and ending with thirds, but this time one minor, the other major. The highest, longest note resolves downward again by step; in fact, the gesture is repeated – but one time with a minor second, one time with a major second. In both cases – the thirds and the seconds – the contour is maintained, the precise intervallic content varied. If you clump together the notes of this second phrase, you get not an octatonic structure, but a chromatic cluster, one that intersects with the little octatonic segment to which the opening sustained single pitch has grown. The final note of the soloist’s phrase turns the sustained octatonic segment into a chromatic one. It is as though the major mode has turned to minor. And yet the structure stays in the background where it belongs – the focus is on the soloist’s eloquent arabesque and the deep perspective opened up by the low chord; craft is at the service of poetry. That is just the opening eight bars of the piece, recently released on a Bridge CD, in a magnificent performance by Joseph Alessi and the New York Philharmonic, led by Lorin Maazel. * The clarity, richness and deft subtlety of those opening bars are maintained throughout the piece. It’s a standard three movement form – fast, slow, fast, with a slow introduction to the first movement, and a chorale for the brass serving as an interlude between the second and third movements, returning (embellished and varied) in the body of the third movement – an effective formal touch. Mindy has a genuine orchestral voice, commanding full-sized gestures that are devised with uncommon care. She enriches the “upward whooshes of sound, and spilling cascades” that she mentions in her program note by structuring them in overlapping waves – not just a single scale or arpeggiation upward, but layers of them played by different orchestral groups. Sometimes these take on a heterophonic character, with more or less simultaneous statements of a figure with small variations. She often deploys a counterpoint of gestures. This middle ground counterpoint – not motive against motive, but gesture against gesture – is an important part of what makes the piece so satisfying. Rather than one thing followed by another like beads on a single string, the musical discourse is more of a woven fabric encompassing many threads. In addition to these richly layered textures there are more direct moments, like the ear-teasing hocket-like passages where chords bounce around the orchestral choirs in rapid succession. The relationship between the soloist and the orchestra is varied, with the ensemble sometimes content to simply set the scene, sometimes closely echoing the solo lines with shadowy resonances. The trombone writing is eloquent and brilliant by turns, sometimes astonishingly brilliant. Mindy must have had a chart of trombone slide positions next to her drafting table, as well as consulting with her soloist. It is no small coup for an American composer to get a commercial recording of an orchestral piece by a top-flight American orchestra, and it must have taken a great deal of persistent fund raising to make the disc happen. It’s a pity, given the wealth of fine orchestral music being created in this country, that such releases are so rare. *) This is the second of two superb concertos Joseph Alessi has premiered with the New York Phil, the first being that of Chris Rouse, which won him the Pulitzer in 1993. **) Note that they will be appearing at Penn on April 4 with a program of Eric Chasalow, Rand Steiger, Yiorgos Vassilandonakis, and Zhou Long. I don’t get out to concerts as much as I would like, or as much as I should, but at the moment I am in the midst of a string of musical events. Here’s a first report. Last Friday, the New York Philharmonic, with its music director Alan Gilbert, did what musicians call a run-out, bringing the program of Stucky, Berlioz, and Mussorgsky/Ravel they were playing for their weekly subscription series at Lincoln Center to the Kimmel Center in Philadelphia. Steven Stucky’s name is deservedly prominent at the moment, and he is best known for a big catalog of masterful orchestral music. (I mean a big catalog, Stucky is another one of those characters who makes me feel slow and lazy.) His Son Et Lumière is from 1988. The music is rooted in a Franco/Russian musical world (hence the apt programming) and is influenced (as I’m sure Steve is tired of hearing said) by Lutoslawski’s language: the preference for harmonies with a very clear intervallic identity, particularly big euphonious stacks of thirds; the vibrant, bustling textures, emphasizing transparent orchestral colors, even when those textures are at their busiest; and forms often shaped by juxtaposition of contrasting sections, like cinematic cuts. The quest for harmonic clarity in this idiom can sometimes affect the melodic profile – there are spots in Lutoslawski where the melodies (say, the first part of Mi-Parti) are little more than arpeggiations of the underlying harmony, with relatively little embellishment. There is a hint of that in Steve’s music of this period, but I think he was aware of the issue, and he successfully avoids the static, somewhat flat quality that can result. Compositions can be understood as critiques of other compositions, and Son et Lumiére responds to minimalism’s emphasis on regular pulsation by employing motor rhythms, but with a richer, less static harmonic language. Despite the reliance on ostinato throughout a good bit of the piece, Steve’s keen sense of timing moves us along at just the right moment. The repeated patterns serve the music, rather than themselves being the musical focus. A darker expressive character inhabits the closing two and a half minutes of the piece. After a tremendous low pedal tone, the ostinatos that have driven the piece so far are set aside, and brief interjections are layered over an impassioned string cantilena, the interjections finally crystallizing into short sharp high trumpet chords. The cantilena cuts off, the glittering, slicing trumpet chords continue for a moment, and then a three-note motto from the unpitched percussion – which had served as a playful call to attention earlier in the piece – now brutally cuts off further discussion. I may be wrong, but I don’t think the Philadelphia Orchestra has played Steve’s music since the premiere of his Concerto for Orchestra back in the 1980’s (not to be confused with his Pulitzer Prize-winning Second Concerto for Orchestra from 2003). Here’s hoping that oversight gets rectified soon. (Update: only on re-reading this post did I recall that Olly Knussen conducted the Philadelphia in Steve’s arrangement of Purcell’s Funeral Music for Queen Mary several years ago.) There is an excellent recording of Son et Lumiére by the Albany Symphony, David Alan Miller conducting. After the brilliance of the Stucky, the Philharmonic showed itself capable of subtle nuances in its accompaniment of Joyce DiDonato in Berlioz’s Nuit d’Eté. It is hard to overpraise Ms. DiDonato – her varied, perfectly controlled, but always gorgeous sound is put at the service of intensely characterful expression. The Berlioz is more about languid gestures than the coloratura of which she is capable, and I was most struck by the inward moments of the piece, the especially quiet spots where DiDonato drew the listeners into the music; a mere superficial projection of the music outward for us to admire is not her way. The performance of Pictures at an Exhibition that closed the program returned to the dazzling mode of Stucky’s curtain raiser. I’m afraid I have to somewhat agree with Peter Dobrin’s sense that there were moments of imperfect balance, but these were offset by tremendous virtuosity, both of soloists and the ensemble as a whole. One moment of imbalance, at least where I was sitting, was the sampled church bell in the last movement of the Mussorgsky – it sounded great, so much better than the usual compromises – (it is a big problem to get a truly low bell sound on an orchestral stage) but it was a bit too much of a good thing. Comment on the Network/Felyx_M concerts from this past weekend, plus the upcoming Eric Owens recital and next week’s Philadelphia Orchestra concerts with James Gaffigan yet to come. – I’ll be hearing lots of music in the next few days – the Network/Mendelssohn Club/Philadelphia Chamber Music Society performances of my Ariel Songs this weekend; the NY Phil at the Kimmel Center here in Philadelphia tonight (a run-out of this week’s subscription program of Stucky, Berlioz and Mussorgsky-Ravel, with Joyce DiDonato, Alan Gilbert conducting) as well as Eric Owens‘s recital, again at Kimmel, next Tuesday. – My hometown is also home to an amazing book store. – A lovely post for the beginning of Lent. – Many of these are quite funny. I was saddened to read of the New York Philharmonic’s unprofessional behavior at rehearsals of Morton Feldman’s Coptic Light in 1986. I was at the performance of that piece. It is worth noting that the conductor for that concert, if I recall correctly, was Gunther Schuller. It is hard to imagine Gunther participating in that kind of unprofessionalism, even though this would have been music rather distant from his own principal interests. Note too, that (again, if memory serves), Gunther conducted Arvo Pärt’s Tabula Rasa on the same program; this two years after I heard him conduct Andriessen’s De Staat at Tanglewood. I have heard some label Gunther as one of the big bad high-modernists, narrow-minded both in his own writing and in his programming, but the fact is a rather more nuanced picture would be more accurate. 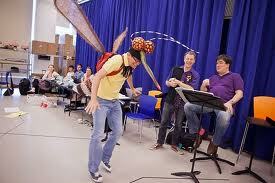 Video here from the New York Philharmonic’s presentation of Janáček’s The Cunning Little Vixen. That’s music director Alan Gilbert in the purple shirt at left. Schoenberg’s Erwartung (Expectation) was the closing work on the New York Philharmonic concert I attended back on the 9th. Like a good deal of Schoenberg, it is music I more respect than love. * Quite unlike Wozzeck, to cite another expressionist opera, I have no emotional connection with Erwartung. ** The piece lacks a compelling shape, something Wozzeck certainly has. (I am not referring to the formal schemes Berg employed – suite, symphony, etc. but to the dramatic contour.) The individual gestures in the Schoenberg are striking – some rather more than others. Unsurprisingly, the moments where the ear can latch onto some sort of repeated pattern are the most telling – for example, the brief bustling spot where the harmony is built up and then quickly dismantled in steady sixteenth note rhythm. The fertility of invention is astounding, but ultimately tiresome. Deborah Voigt’s performance was powerful, with plenty of variety in tone and character. It was a good example of a strong performance selling a difficult piece, as the audience called her back repeatedly. I thought David Robertson was superb here and all through the evening. I have commented elsewhere about sitting at a performance of Shostakovich’s Lady Macbeth and thinking, “Well, it ain’t Berg”. I’m sorry to say I was thinking the same thing at Erwartung. The program started with Shostakovich’s first symphony. I had forgotten the piece, but the bits that show up in the orchestration textbooks – the timpani and piano solos, for example – brought it back to me. Even with a piece that early in Shostakovich’s career, the listener is left wondering just how sincere and how ironic the music is supposed to be. After intermission, there were announcements and speeches honoring retiring members of the Philharmonic. Surely there was no playful intent, but it was a little funny to then perform Rachmaninoff’s The Isle of the Dead immediately after a ceremony for retirees! *Kyle Gann has written about how few pieces by Schoenberg people actually like. I think my list might be longer than his, but it includes the 2nd and 4th quartets, Transfigured Night, Gurrelieder, the first Chamber Symphony, Pierrot, the piano suite, the Serenade, Book of the Hanging Gardens, the String Trio, Ode to Napoleon, Moses and Aron, perhaps a few others I am forgetting. The “respect” list includes a number of other pieces; and then there are the ones I actively dislike. Everyone I have ever talked to about it (OK, so not that many people) hates the Wind Quintet. **I also feel little emotional connection with Lulu, but that is a different situation because the music is so gorgeous. The New York Philharmonic is running a charming ad campaign for its upcoming presentations of Janáček’s The Cunning Little Vixen – see the Times for this morning, or the orchestra’s website – and I bet this will be a hot ticket in the manner of last season’s Ligeti opera. But in my composer-centric universe, it strikes me as odd that nowhere do the ads mention the composer of the piece. – Mimi Stillman has posted video of Dolce Suono’s performance of Songs of a Wayfarer, with Eric Owens. – Soho the Dog has an apropos comic strip. 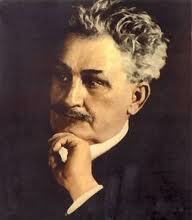 – New York Philharmonic “Focus on Mahler” page. – Mahler makes the Times Op-Ed page. First, a correction: in this post, I listed works by Higdon, Torke, and Salonen as the only pieces by living composers during next year’s Philadelphia Orchestra season. I omitted a work by Lorenzo Palomo, whose Nocturnos de Andalucia will be performed. Apologies to the Philadelphia and Mr. Palomo. Second, by way of comparison: The New York Philharmonic will perform seven works by living composers during subscription concerts next season, plus six more on special “Contact” new music concerts. In addition, although he is technically deceased and therefore not a living composer (at least not on this planet), the Philharmonic will also play Stockhausen’s Gruppen as a special event. The San Francisco Symphony will also play seven pieces by living composers on regular concerts – but they will additionally do a good bit more as part of next year’s iteration of the “American Mavericks” festival, which will also tour. Visiting orchestras to Davies Hall in SF seem to play a lot of new music as well, including the Philadelphia Orchestra’s presentation of a work by Behzad Ranjbaran. Now, four pieces by living composers is about four more than a great many orchestras in this country will play next season, and as a composer and a concertgoer I am grateful for these four. Yet, I do hope the Philadelphia will increase its presentations of new music as Yannick settles in.